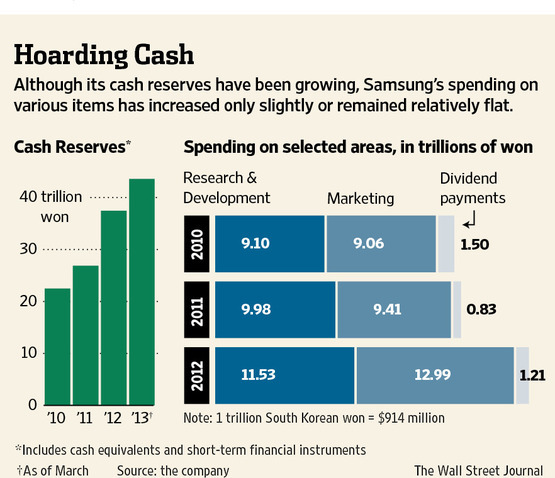 Much is being made of Samsung’s hoard of cash, estimated at $28.5 billion once the South Korean conglomerate’s debt is taken into consideration. At any rate, the Galaxy maker has watched its net cash almost triple in the past year, thanks to double-digit profits fueled by the rising sales of its mobile division which makes smartphones and tablets. In just three years, mobile phones have grown to be 74 percent of Samsung’s profits, overshadowing sales of LCD TVs and memory chips. 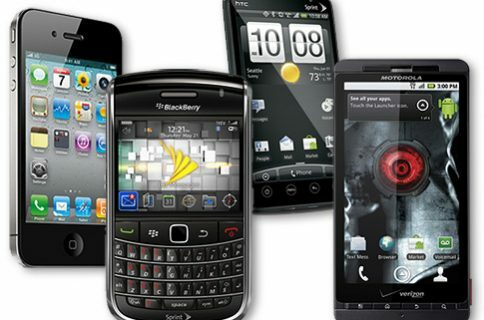 On other words, three out of every four dollars Samsung earns come from mobile devices. However, Apple remains the industry’s most-profitable player, retaining a $145 billion cash pile while offering anxious investors a $100 billion stock buyback. Is Samsung destined to follow Apple’s footsteps, or repeat the errors of other Asian giants, such as Panasonic, drowning in debt? 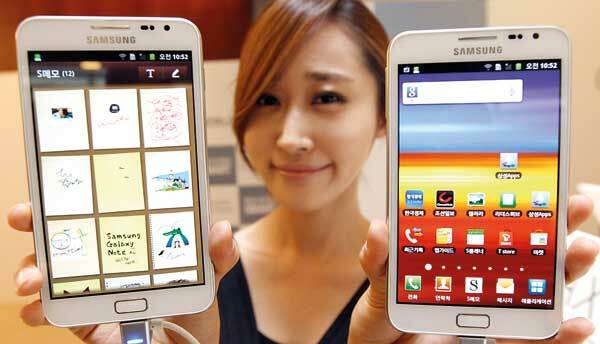 According to the Wall Street Journal, Samsung reported a 42 percent jump in profit for the first quarter of 2013. In a year, the smartphone maker grossed almost $40 billion, or $28.5 billion when debt is subtracted. 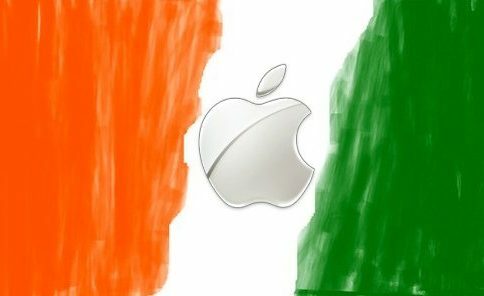 By comparison, Apple kept its $145 billion in cash safe overseas, deciding to borrow a cool $100 billion to increase its stock buyback. It is the first time Apple incurred any debt in 20 years. Samsung’s pile of cash puts the company behind the $64 billion amassed by China Mobile (which is likely to start selling the next iPhone this year), but ahead of Toyota Motor’s $27.5 billion, the report said Wednesday. How did Samsung amass such a small fortune? Although its stock price has almost tripled since 2008, the firm’s dividend has dropped for the past five years and has fallen five percent in 2012 from 15.8 percent in 2007. Likewise, as more and more effort has gone into competing against Apple’s iPhone, capital spending by Samsung on plants to produce chips and other widgets hasn’t grown since 2011, according to the report. While Samsung would only tell the Journal that it will invest in “areas like facilities, R&D, and marketing that will help the company solidify or boost competitiveness,” some observers hope the company does not follow the path of Japan’s Sharp or Panasonic. In March, Samsung paid around $106 million for a three percent stake in electronics maker Sharp. 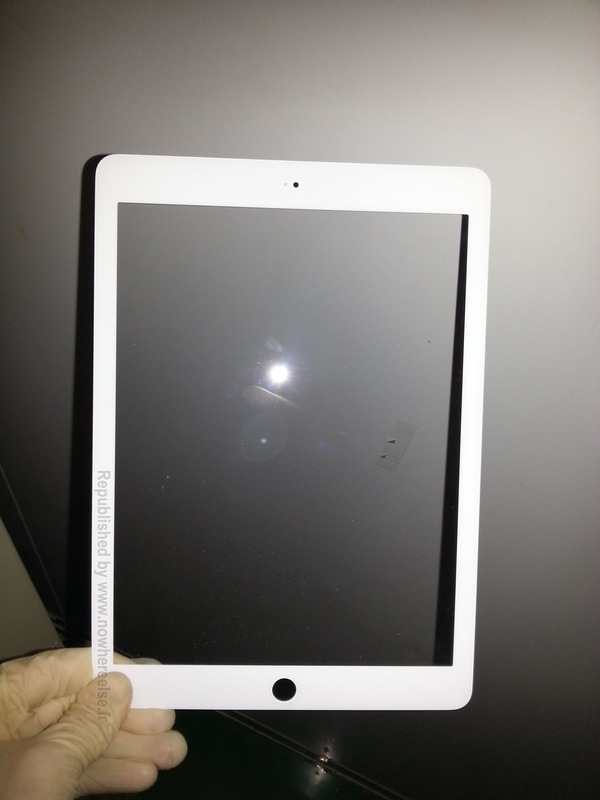 After falling on hard times due to declining demand for LCD TVs, Sharp reportedly landed a contract with Apple to produce screens for the iPad and the iPhone 5S. 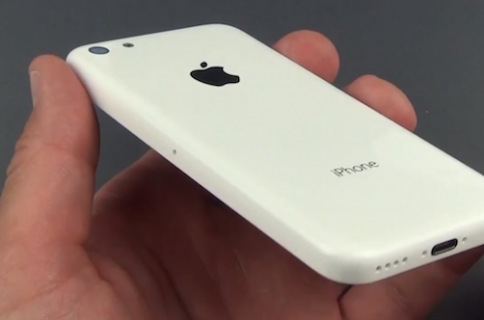 Meanwhile, Samsung is believed to have lost its contract with Apple to produce displays for iOS devices. While currently Samsung is enjoying success in the mobile phone arena, that could change – just ask Panasonic. Once a corporate giant, Panasonic was caught flat-footed amid a declining market for TV sets. The Japanese giant’s greatest sin: it bet heavily that plasma TVs would be hot sellers, pumping billions into factories. The company has lost more than $15 billion, its stock now listed as “junk,” according to the newspaper. It’s an old story of how today’s technology dreams can quickly become tomorrow’s nightmare.